It’s no secret that marketers love their acronyms. CPC, CTA, SEO, RSS—sometimes it feels like they’ve created their own language. And we know it can be a hard one to learn. Our goal today is to debunk a few of those acronyms: TOFU, MOFU, BOFU. Disclaimer: Even after you know what these terms mean, you’ll unfortunately (or perhaps fortunately, depending on your dietary preferences) probably still think of the square-shaped protein every time you hear these acronyms mentioned. What is TOFU, MOFU, BOFU? These terms refer to the stages of the sales funnel (but don’t let the name fool you—this funnel is a staple for marketing and sales alike). 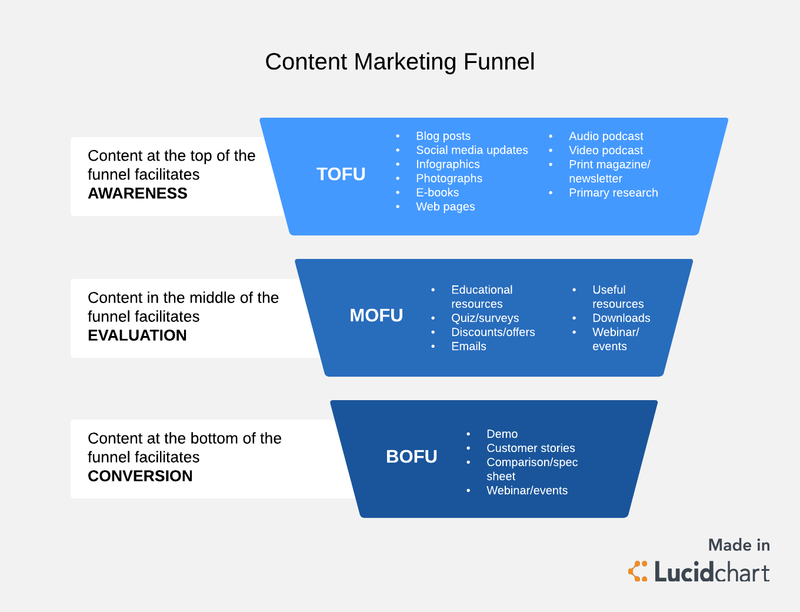 TOFU (meaning top of the funnel) MOFU (meaning middle of the funnel), and BOFU (meaning bottom of the funnel) build off of each other to nurture leads in order to ultimately lead to conversion. This funnel provides a basic framework for any organization to start off of, but the details will vary greatly based on your buyers. Your TOFU, MOFU, and BOFU stages should be specific to your buyer persona, which means your very first step should be to fully understand who your buyer is and what their pain points are. Only then can you tailor your content for these stages appropriately. Each stage must provide the appropriate type of marketing to interest leads without being too forceful. It’s crucial that your lead and nurturing efforts offer up the right type of content at each phase of the buyer’s journey—and yet 65% of marketers report being unsure of what content is best for each stage. So let’s take a look at what these different stages are and what you should ideally be providing at each. TOFU is the awareness stage where you have your widest and most general audience—you’re trying to attract a large pool of people who have a problem and are looking for more information about what that problem might be. According to Adweek, over 80% of shoppers do online research before making a purchase, so at this stage, you just want to make sure you are their information source. Use keyword planning to find topics and keywords for TOFU content to make sure it’s relevant for your buyer—this is the first chance for them to find you. TOFU content should be purely educational and should not include anything even vaguely related to a sales pitch. The buyer simply isn’t ready for one at this point, as many are still trying to fully understand what problem they have. So don’t mention your company or product. Just provide helpful information for their question or pain point. Social media: Know what channels your buyers are on and focus your efforts accordingly. Infographic: Offer a visual format to help buyers understand the problem or question they’re facing. Blog: Do your keyword research to create an overview blog post about a certain problem or pain point that is easily found by buyers. Video: Videos should be short at this stage and should just address the problem, not your solution. Quiz: Learn more about your buyer by asking questions about the problem they’re facing. E-book/whitepaper: Create a more in-depth piece on the problem your buyer faces. Example: We wrote a blog on reasons why you need to elevate the buyer experience. 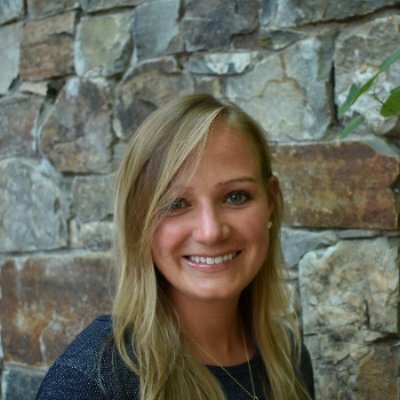 This post was purely educational and addressed a problem sales org face—we didn’t bring in Lucidchart. Many consider this to be the most critical stage of the funnel because now you have a variety of interested leads whom you need to qualify. At this consideration/evaluation stage, people have accepted that they have a specific problem to be solved and are actively looking for a solution, which means you have a targeted audience. They are researching different options and carefully weighing the value of each. Now you can bring your own product or service into the discussion. MOFU content should continue to educate but should also address why you are the best solution. Leads are warm, so take the opportunity to convey how your product or service can help them. This stage can also be a good opportunity to offer gated content to gather contact information from buyers. Blog: Answer a specific question that relates directly to your product or service. Case study: Help buyers see your product or service in action by demonstrating the benefits it has provided another company. Whitepaper: Include detailed information on a topic to establish why your solution is the best option. Webinar: Provide training on a topic, and be sure to leave time for questions. Guide/How-to content: Offer step-by-step instructions on how to solve a problem. Template: Let buyers see for themselves how your product or service can solve their problem. Comparisons: Compare solutions, not vendors, at this stage. Example: We wrote a use case about why you need account maps to optimize the buyer experience, and we tied in our product by explaining how you can make account maps in Lucidchart. BOFU is your golden stage. You now have a narrow audience of highly qualified leads who are ready to buy. They’ve done their research and are interested in your product but are likely comparing several other options as well. The right offer can be the nudge they need to make a decision in your favor. BOFU content should showcase your product, demonstrating how it works, showing off features, and outlining specific benefits customers receive. Now is the time to show how your product or service solves their pain point and beats the competition. Product demo: Let buyers see how your product actually works. Whether on-site or in a video, showcase features and relate them back to benefits, and show how you outperform the competition. Product comparisons: Help buyers understand where your product or service wins by clearly outlining the differences between you and the competitors. Free trial: You don’t know ’til you try. Let buyers test your product out without making a big commitment. Testimonials and case studies: Customer stories are also valuable in this final stage, as they are content that converts and provides third-party validation of your offering. Example: We wrote a case study about Clarabridge, a company using the Lucidchart Sales Solution to build account maps. We outlined the benefits Clarabridge has seen, the features they love, and the products they used before that just weren’t cutting it. Buyers today expect a better experience. You can’t resort to cold calling and pressuring buyers—instead, you need to focus on educating and providing resources as they progress logically through the funnel. 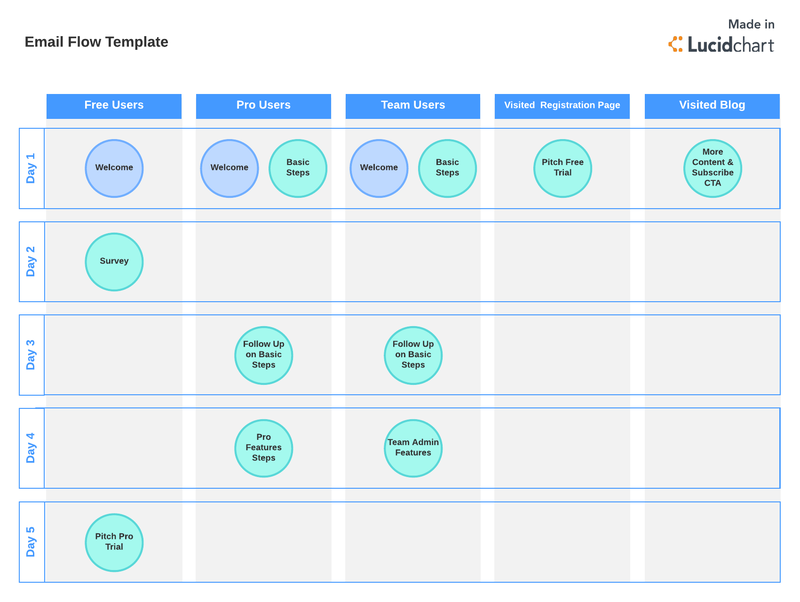 Try using Lucidchart to map out the content you need at each stage of the funnel. Using hotspots, you can link directly to content assets as you create them so that everything you need is organized in a single location. The persistence and patience will pay off—research shows that companies who do lead nurturing well see 50% more sales-ready leads, and those leads make 47% larger purchases. And if that’s not sufficient, you could always reward yourself with some real tofu.